Living in New England and being inspired by the many artists here I am encouraged and have the opportunity to paint both plein air and studio painting. Monhegan Island was my first plein air adventure followed by the Coast of Maine with artist, David Lussier and New Hampshire with Sean Dye. 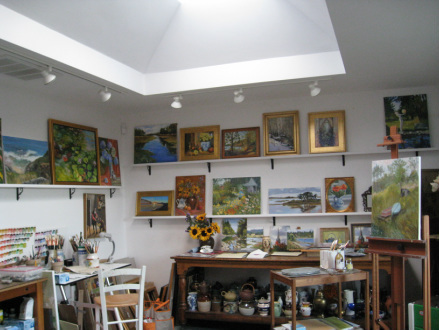 In the studio I have the opportunity to study with local artist Cecila Judge and William Bartlett. At home, I am inspired by the life around me in the garden, in the fruit of the season and the simple items of everyday life. It is the creative challenge of painting these images in a unique way that I aspire to. I love the opportunity to paint the life and world around me with vivid colors and dramatic light. Painting in oils provides me the opportunity to create art that expresses life in many ways. Color speaks emotionally and I want to communicate those feelings in my paintings. Most of my Landscape paintings are based on drawings, studies or photos I have done because I was drawn to the subject and wanted to create that on a canvas. It is this experience of watching the painting unfold that is so amazing and wonderful to me. As an artist, my experience gives me the opportunity to paint the world as I see it in its great array of colors. While at times this is an incredible challenge it is one that I continue to look forward to and learn from.